So you have a pretty webpage, and you’d like to send it out as an html email. Not so fast… Coding an email is not the same as coding a website. One of the main differences is that you can’t use external stylesheets or even style tags in your html emails. You have to use inline styles. That means you have to put a style on every element that you want formatted. Yes, that is a pain, but if your CSS isn’t coded inline, it’s likely to get stripped out by many email clients. * And that will make your email design pretty funny looking! 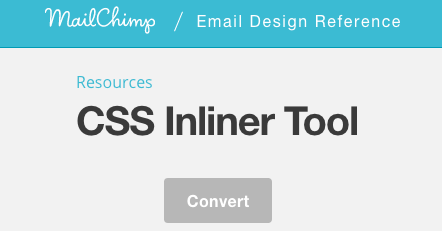 Writing CSS inline is a bore, so let MailChimp do the work for you. *This is changing. However, big hitter Gmail, for example, still ignores anything but inline styles.